This house, located in Epfig, is ideal for 6 vacationers. It offers 3 bedrooms, a furnished garden and WiFi. The kitchen is well-equipped for cooking up your favorite meals. Enjoy your feast around the dining table which seats 6 or outside, in the garden. The house features central heating, ironing equipment, a washing machine, a vacuum cleaner and cleaning products. Note that bed linen are included in the rental fee. End cleaning has to be done by the guests or can be available with additional fees to be paid on site. A tourist tax of 1.1 euros per person per night will be required upon arrival. Please bring your own towels. We were warmly welcomed by Andre to this delightful home situated in the beautiful town of Epfig. Spacious, clean and comfortably furnished this house is surrounded by lovely flowers and maintained in all respects. The eat-in kitchen, home-like living room, three well sized bedrooms and separate toilet and bath facilities make this ideal for 3 or more people. 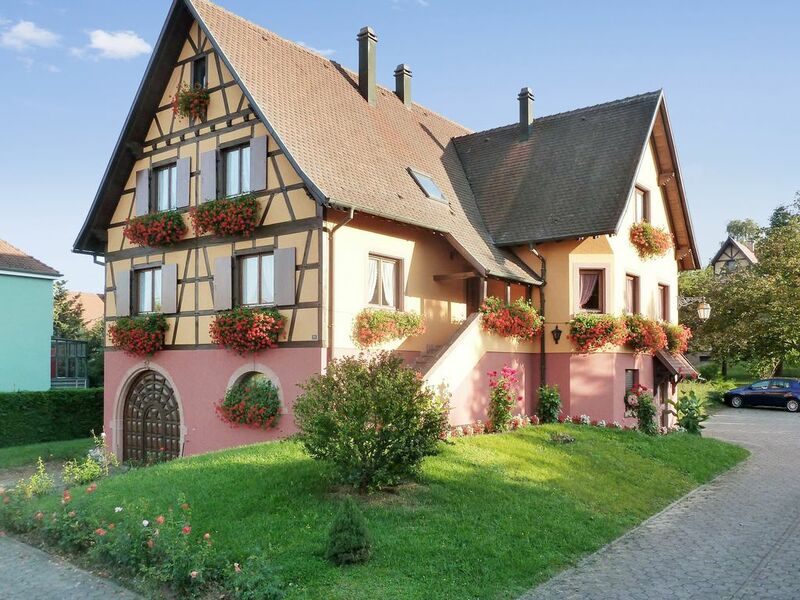 Be advised that you must bring your own towels but otherwise this house has all you could need for a stay in Alsace. Excellent for a family of all ages. I would highly recommend staying here. Our stay in Epfig was wonderful. We were warmly welcomed by our house owner who kindly invited us to a wine tasting. He was kind, generous and we couldn't have had a more lovely home to stay in. Centrally located in the Alscase region, we were able to plan day trips along the wine route as well as a day in Strasbourg. I would highly recommend this house. Idealer Ausgangspunkt für Touren in die Umgebung und nach Straßburg. Alles ist sehr sauber und vollständig eingerichtet. Die Einladung des Vermieters zur Weinprobe war eine tolle Überraschung. Leider ging das Internet bei keinem von uns. Es hieß immer das Passwort stimme nicht. Der Vermieter konnte uns nicht weiterhelfen. This house enjoys a privileged location that will allow you to enjoy your stay in the area. Many activities await you in the surroundings, such as Hiking, Cycling, Swimming, Horse riding, Rock climbing, Tennis and Golfing. You will also find great bars and restaurants at 30 km and a supermarket within 500 m. Golf de Strasbourg golf course is 35 km away from the house.